To use this form place the quantity in the space provided then hit the "Buy Me" button. You can always change your mind later because the transaction is not processed until you submit your credit card information. Live Plants are shipped early in the week so they don't get caught in the weekend layover. All prices on this site are in US dollars. Multiple plants shipped to the same location will receive a shipping discount calculated by us by hand because of our lack of technosavyness. WOW!! Full of color and fragrant too! Mature plant growing in a 5" Hydro planter, Blooming Size.Comes complete with nutrient and instructions. Blooming size plant growing in a 5" Hydro pot. Known for its wonderful fragrance. Some people say it smell like chocolate others say it smell like cotton candy. Grow this beautiful, fragrant plant in a south or southeast exposure. Blooming size plant growing in a 5" Hydro pot. This plant has beautiful mottled foliage and is a very easy plant to bloom. 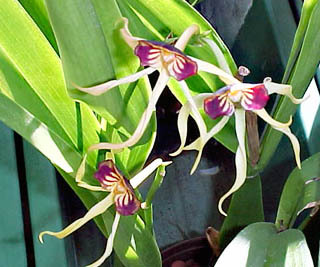 It likes filtered sunlight and will produce at least two blossom on each stem. Blooming size plant growing in a 5" Hydro pot. 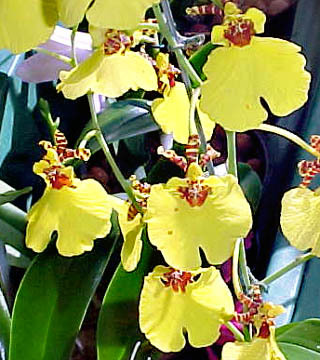 This is a sunny yellow oncidium that is a very easy rebloomer when grown in a south or southeast exposure. Flowers last for about two months. Blooming size plant growing in a 4.5" Hydro pot. 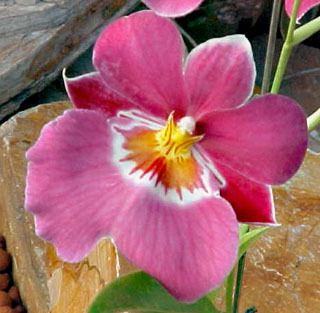 This is a very easy plant to grow and to bloom. 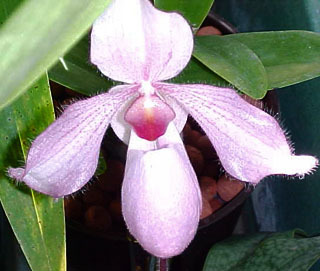 Grows very well under lights or with just filtered or dappled sunlight. It blooms most of the year. Compact growing mini cattleya growing in a 4.5" x 3.5" hydro kit. Requires about four hours of sun a day. Also does well in a light garden. Expect flowers two to three times each year. We have a limited supply of Slc. Love Castle. 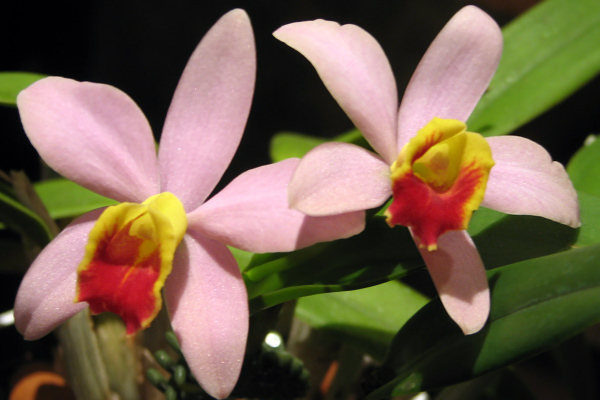 This is a miniature cattleya that blooms twice a year with three to four flowers per sheath. The color is a vibrant red. 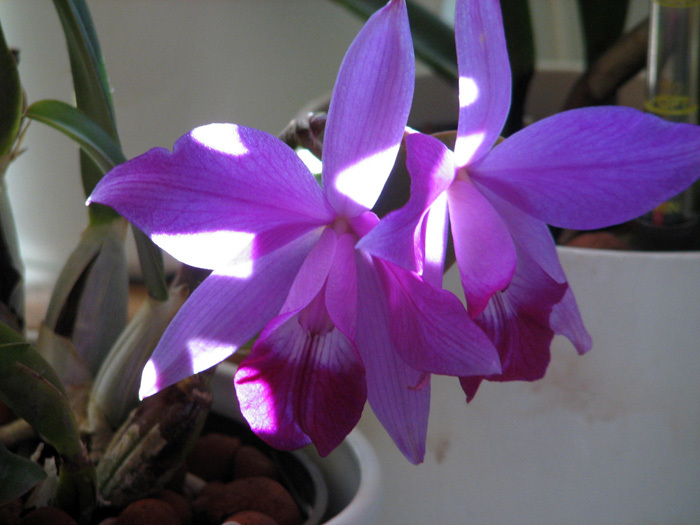 The growing conditions for all cattleya is a minimum of four to six hours of sun per day (when the sun is shining) or under lights in a light garden. 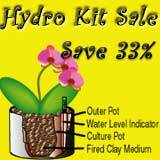 These mini catts are growing in our 4.5" x 3.5" hydro kit. needs at least four hours of sun a day in a bright south to southeast facing rooms. 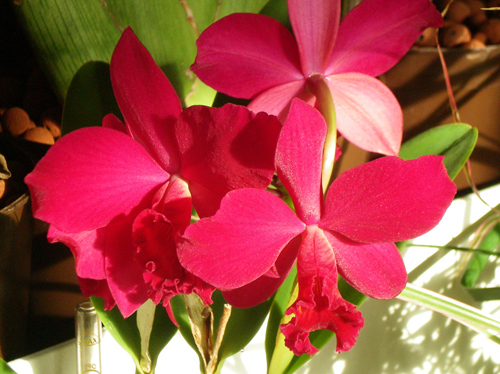 All mini cattleya do very well on a light cart. 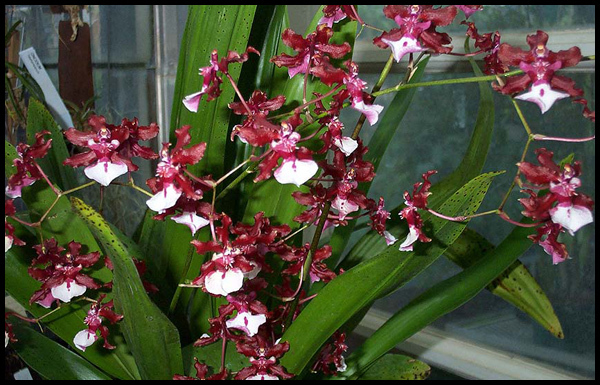 This mature blooming size plant requires bright light with some sun, east or west exposure is ideal. Fragrant flowers last approx. 4 weeks. Hefty plant growing in 6" x 5" Hydroculture planter. Comes complete with nutrient and instructions.